It’s become a reliable January tradition for manufacturers to introduce an amazing array of consumer devices at the Consumer Electronics Show (CES). 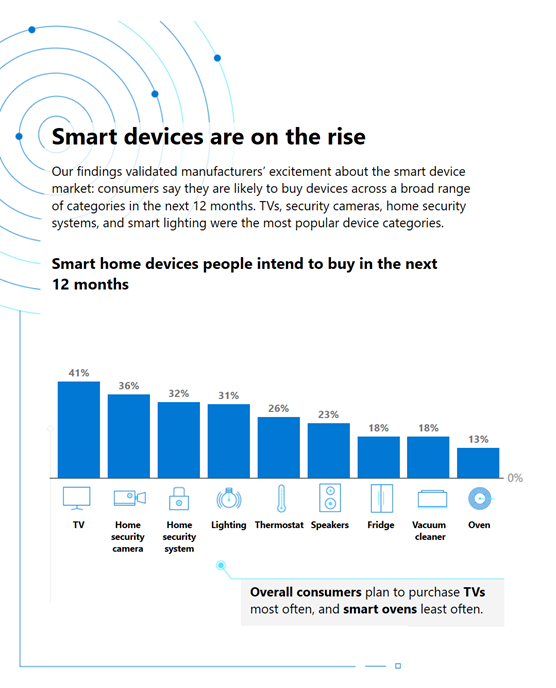 These new devices enter a booming market, and Gartner predicts “14.2 billion connected things will be in use in 2019, and that the total will reach 25 billion by 2021.” This year connected devices will dominate CES again as device manufacturers lean further into their vision for the smart home. These devices’ promise is resonant – smart home experiences will remove friction from our day-to-day lives, save us money, keep us healthy, and help us lower our environmental footprints—ultimately, empowering us all to achieve more. As people open their personal lives and spaces to these smart experiences, they’re also becoming increasingly attuned to the security risks that smart technology can introduce. Their concern builds as news headlines give shape to the many ways that smart devices are being weaponized by attackers to invade personal privacy, steal sensitive data, and take down infrastructure with scaled attacks. We set out to better understand how the allure of smart device experiences stacks up against the concern for security, and who consumers hold responsible to secure smart devices. To this end, we partnered with Greenberg Strategy, a consumer research firm to poll more than 3,000 people in the US, UK, and Germany. The research showed that consumers demand action from manufacturers. 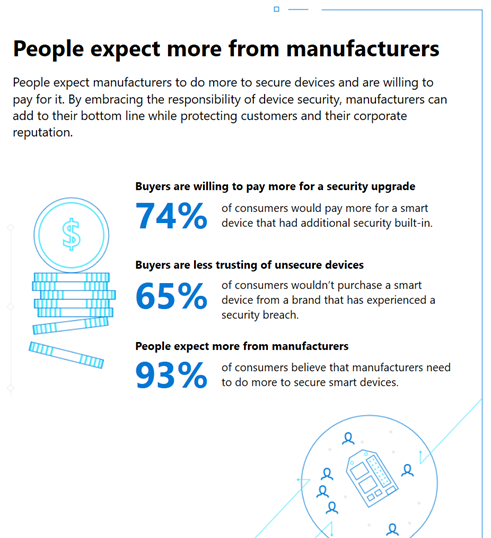 More than 90% of people expect manufacturers to do more for device security, and most people will avoid brands that have public breaches. On the other hand, consumer security awareness creates opportunities for manufacturers who design devices with security in mind. Security is the top consideration for consumers thinking of buying a device, and consumers are willing to pay more for highly secured devices. 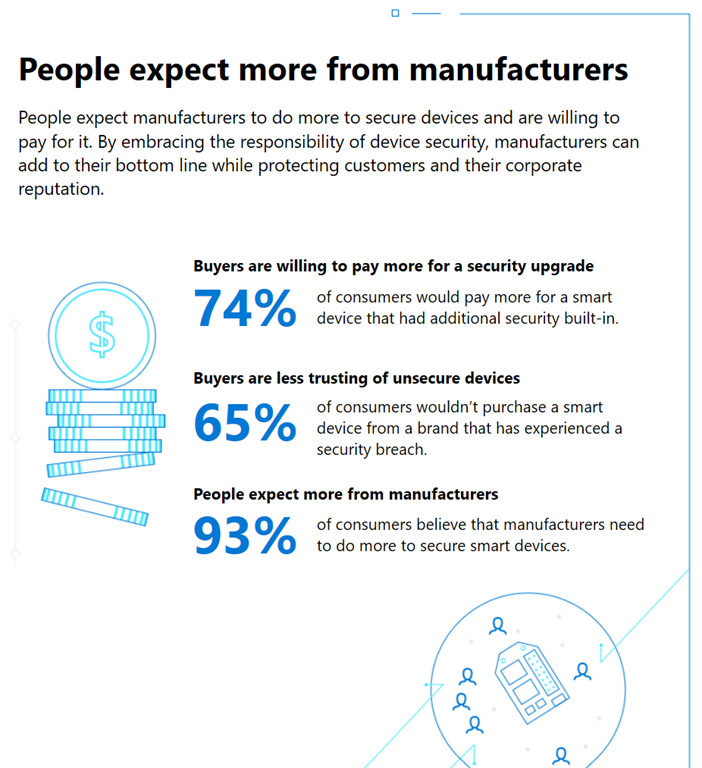 In sum, security is a revenue driver for manufacturers, not a cost driver, when it comes to connected devices. 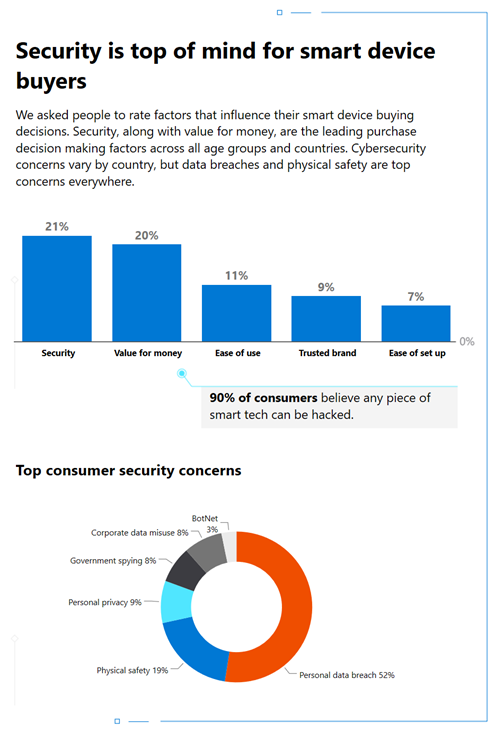 As consumer excitement builds around smart devices, cybersecurity risks grow each day. To minimize the security risks that smart devices introduce to homes, businesses, and society, it’s time for manufacturers across industries to redefine “smart.” If a device is not secure it is not smart. This need for smart, secure devices is why Microsoft introduced Azure Sphere - to make it easy for manufacturers to create smart products that are innately secured. Devices built with Azure Sphere always maintain their security health through a combination of secured hardware, a secured OS, and cloud security that provides automated software updates. 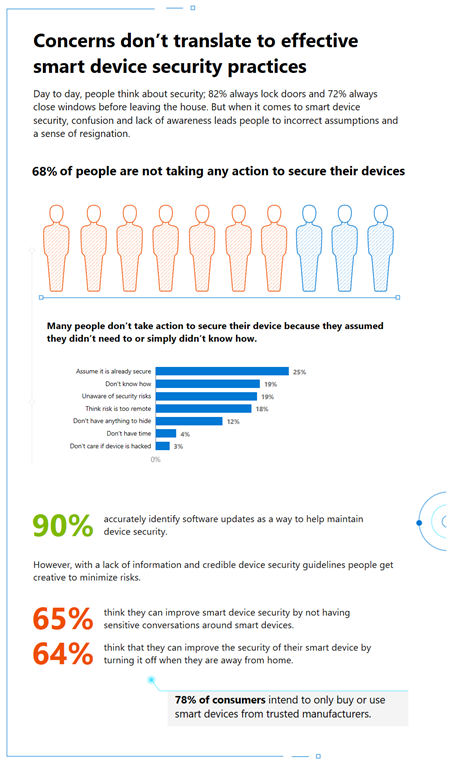 When device security is built-in, manufacturers and their customers can confidently embrace the opportunities and benefits of smart devices. Learn more about how customers like E.ON are building smart experience secured by Azure Sphere. Check out our interactive graphs to explore how responses varied by age and country.